“25 Forward Thinkers Defining the Future of Fashion”, "Top 100 Women in Wearable and Consumer Tech", "12 Amazing People You Need To Know In New York Fashion Tech…, Sylvia Heisel is a renowed figure of fashion tech. The american fashion designer specialized in 3D printing tells more to Le Boudoir Numérique about her prototype of compostable dress presented at Première Vision Paris, in September. Le Boudoir Numérique : You are a fashion designer specializedin 3D printing. Why did you choose to work with this technology ? Sylvia Heisel, fashion tech designer : I started as a traditional fashion designer in the US. I had my brand for many years, mostly evening dresses, very high end. Ten years ago, I felt that, as a brand, we kept making the same clothes, every single season. We would have a all new collection, we would talk about what was new, new, new, and we would make the same clothes again. It wasn’t creative anymore. The customers, the retailers that we had didn’t want anything new. It got very uninspiring. At the same time, you could see that the world was going to change. I felt the need to adapt to it. As technology is what would actually drive this change, I started learning about it, going to conferences and studying the differences between how the electronics industry and the fashion industry manufacture products. I made some designs with wearable tech, for smart watches, incorporating electronics. Having done some of that, that led me to 3D printing. I have been doing 3D printing for about five years now. And it’s just starting to be at a point where you can actually begin to make clothes. On your website, one can see un bag, a coat and dresses in 3D printing. Could I buy a dress made by the Heisel Design Lab ? We don’t produce or sell clothes at this point. We do one-off products or prototypes for designers and brands. We teach classes and lead workshops in 3D printing for fashion in schools. The pieces that we have done have been shown at fashion and tech events around the world, at CES 2016 for instance. What we want to do is to develop a system for other designers to make things in 3D printing not do it ourselves. We want 3D printing to become a new way to make clothes, to develop it as a sustainable fashion, as a manufacturing way. And each dress we have made is a further exploration of how the technology will work, like the prototype “Dress #4 for compostable fashion” we just made for the show Première Vision Paris. What is the particularity of this dress ? The dress is produced by 3D printing in biodegradable bioplastic, in that case a corn byproduct. Most plastic is made from petroleum. When it’s made of petroleum, it will never change its molecular caracter. It will stay for ever, or almost for ever, in the natural environment. The bioplastics will biodegrade from two years to a hundred years. Not thousands and thousands of years. Composted, bioplastics will absolutely go back into the soil. The corn byproduct that we are using is made in Kansas, in the US and will biodegrade in landfill in a couple of years. 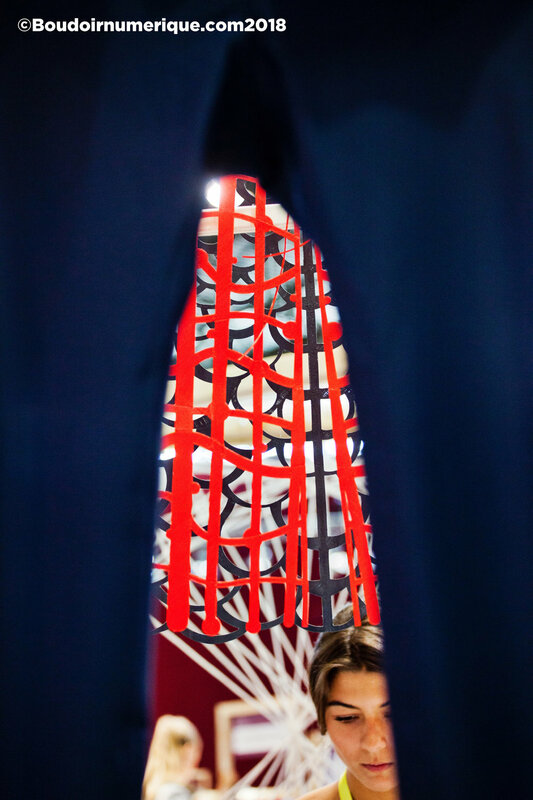 In Germany, the company WillowFlex makes it into filaments, like a string that will go to the printer, without any waste, because only the actual dress parts are made. Could we say that your dress is compostable ? Absolutely. You could literally put that dress in your backyard with the vegetables clippings and it would be gone in a couple of years. We tested a piece that we put out in the compost in the garden and it did all shrink within one year. About half of it was gone. Naturally, problems remain. That kind of compostable plastics holds smells. The dress absorbs everything, oils, sents, etc. And once it gets dirty, you cannot wash it. So yet it’s not easy to wear. And it’s not flexible enough to be really confortable. Our work needs a lot of experimentations. Finding the right material, how thick, how thin, and working with what the material can do, the same way you would with a fabric. It’s very early in this technology but what I would like is to print at a big scale clothes that are fast fashion, that you could compost. Recently, the rise of public consciousness concerning the damage against the environment caused by fast fashion make people turn to slow fashion, a movement to wear a garment longer and to consume less. But your vision of the future would be to offer an alternative in printable and compostable fast fashion ? Slow fashion is a fantastic solution for a lot of things. But I am not sure if it is always realistic for fashion. How do you tell every young woman in the world who is starting to make some money, who wants to go shopping and is not well educated about sustainable fashion : “Dont buy something unless you are sure it’s quality. You are gonna wear it for ever.” I am not sure that she will listen. This message makes it very serious. Why not print instead a product that doesn’t arm the environment ? She could buy something not expensive and wear it twice. And then put it out with the vegetables clippings. Have you tried other materials for 3D printing ? What about false fur ? Could we print it ? We are experimenting with recycled plastics. We can’t make a dress yet but we are working on it. Concerning false fur, I have seen printings as fine as fur. But it’s very expensive for now. Nevertheless, I think the opportunity is to create new things that look different. Not to recreate anything that we have. With 3D printing, designers could create products that are new. 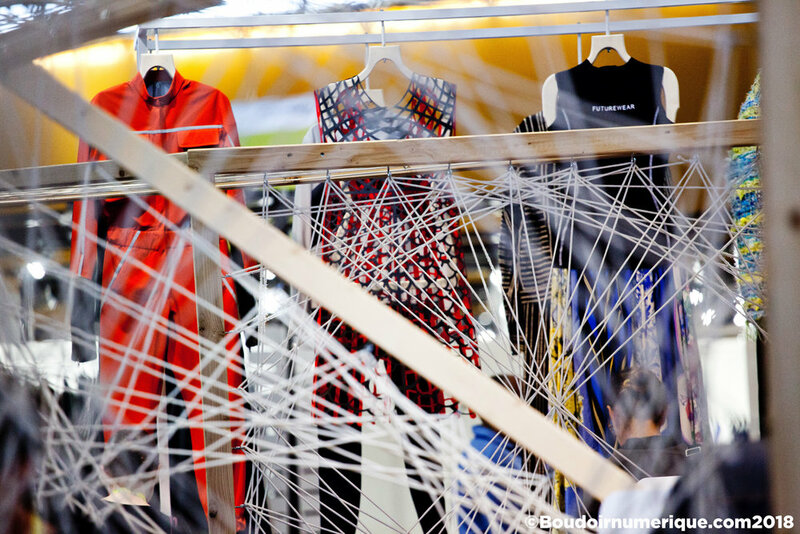 Do you think that 3D printing and fashion tech has a role to play in the fashion revolution for sustainable production ? Absolutely. Major industries, like medicine, cars, airplanes are using 3D printing. Fashion is not. We can print heart valves and parts of engines but we still can’t print buttons. It’s kind of sad. 3D printing and technology are still very new for the fashion industry but it’s coming quickly. For instance, in our classes and workshops, there is more and more interest from fashion students about these topics. I am hopefull that the fashion industry will see how many technological opportunities there are. 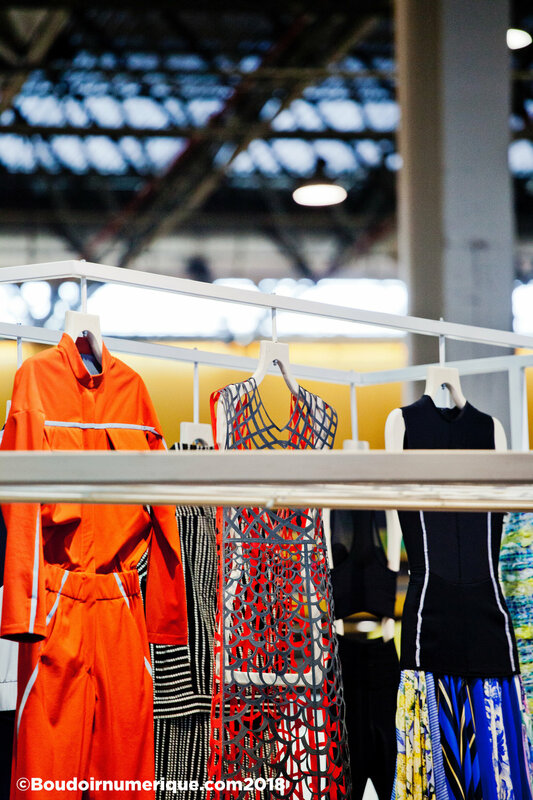 ← Fashion Tech Week Paris : "Fashion and tech communicate better"